This artist concept shows Comet Hitchhiker, an idea for traveling between asteroids and comets using a harpoon and tether system. 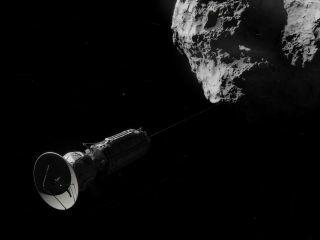 A NASA spacecraft may one day sling itself from one comet or asteroid to another using a harpoon and a superlong tether. That's the idea behind Comet Hitchhiker, a proposal that received funding last year from the NASA Innovative Advanced Concepts (NIAC) program, which seeks to encourage the development of transformative exploration technologies. Comet Hitchhiker would grab hold of an asteroid or comet using its harpoon, then let out some tether while applying a brake to capture kinetic energy from the target object. The probe could then land softly by reeling in the line, which would likely need to be 62 miles to 620 miles (100 to 1,000 kilometers) long in total. Rapidly retrieving the tether (using the harvested kinetic energy) would accelerate Comet Hitchhiker away from the body and on toward its next target, all without the need for any kind of propellant, NASA officials said. Comet Hitchhiker, shown in this artist rendering, is a concept for orbiting and landing on small bodies. Comet Hitchhiker could also get to faraway destinations relatively quickly, according to Ono. By hopping onto a comet, the spacecraft could arrive at Pluto's orbit in about 5.5 years, Ono wrote; for comparison, NASA's New Horizons spacecraft traveled for 9.5 years before reaching the dwarf planet for its epic July 14 flyby. "We strongly believe that the Comet Hitchhiker concept will advance the frontier of space exploration to the most exotic worlds in the solar system," Ono wrote on the concept's NIAC page. But this is all in the realm of speculation, for Comet Hitchhiker remains a concept in early development. The study received a 2014 NIAC Phase 1 award, which grants research teams about $100,000 to perform initial analyses over a period of nine months. Phase 1 awardees can apply for a Phase 2 grant, which is worth up to $500,000 for two more years' worth of concept development. Landing on a comet isn't as crazy as it may sound; the European Space Agency's Rosetta mission pulled off the feat last November when its Philae lander touched down on Comet 67P/Churyumov–Gerasimenko (though Philae's anchoring harpoon failed to fire and the probe bounced twice before finally settling on the comet's surface).